Shan State is Myanmar’s largest province and larger than the entire State of New York. Most outside this Burmese region have never heard of Shan State, but this massive sub-tropic tableland has an average elevation of 3000 feet, perfect for the cultivation of poppies for which it is very well known (in fact and fiction) as the center of the “Golden Triangle”. Never before presented outside a tiny minority of the Burmese community, this unbelievable collection of garage and psychedelic rock, raw folk blues ballads, and country -western styled music is a product of Shan and Pa’o musicians hailing from the early 1970’s. 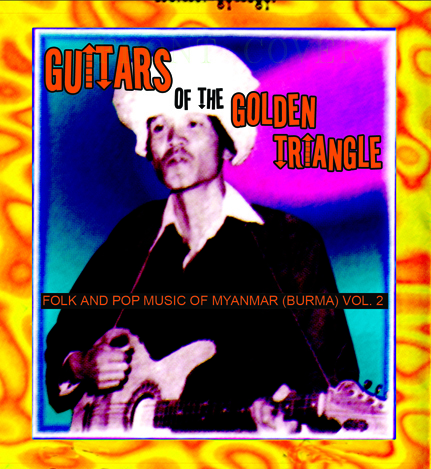 Discover the music of Lashio Thein Aung (AKA the “Burmese Texan”), Khun Paw Yunn (a “Black Shan” Pa’o rocker) and Saing Saing Maw: The original Shan legend who wrote and sang garage psyche rock songs, usually backed by a tight unit of organ, bass, drums, and perhaps the most stinging electric guitar in Burmese history. There is little reliable information about these mysterious pioneers and most Burmese have never even heard this material. The cuts on this CD are almost impossible to find in ANY form or quality. They were transferred directly from old cassette tapes and a few tracks have dropouts (some of them quite severe). Most of the master tapes are thought to have been lost or destroyed many years ago so this may be the only link to a phenomenal “lost scene” and we’re thrilled to resurrect it for those interested in folk, rock and pop styles from lesser-known regions of the globe.